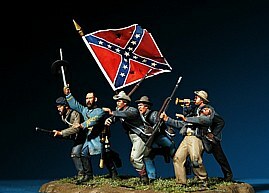 Responding to many requests, we are pleased to offer, exclusively to our direct retail customers, matt painted Traditionals Civil War Model Soldiers. Available only via direct order to Shenandoah, this new range of figures is based on the existing gloss painted Traditionals range. Painted to a high standard collector quality matt finish with landscaped bases including static grass and textured groundwork, you can order directly from the following catalogue listing. 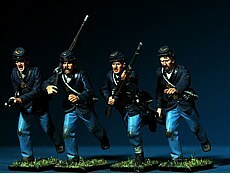 Pictured here are just some of the figures available, in fact any figure from the Traditionals gloss painted listing can now be ordered in this new matt style including our extensive range of flagbearers and flag sets. Contact us here, for further details or to specify your request. In the meantime you can order easily from the following catalogue.